There are numerous text to voice apps around nowadays. As a writer my biggest task is editing (I must admit this is the hardest task to motivate myself into), but it often helps if I listen to my text instead of reading over it. For Week 24 of the #52Tech challenge, text to voice app NaturalReader is discussed. NaturalReader offers several packages of software downloads, and a cloud-based subscription service. The application works with most common document types such as Word docs, PDF files and webpages. There are 30 “natural” sounding voices in seven languages. You can switch voices and adjust the speaking speed. The US and UK English voices also include both male and female kid voices. The app packages listed below offer (for Windows) MS Office addins, various natural-sounding voices, browser plugins and OCR technology and conversion to mp3. Pro versions offer batch conversion to mp3 files, allowing you to take your listening on-the-go. There is a cloud based package which allows writers to access up to 30 voices online (via a desktop app) or 4 offline voices, and unlimited access through an iPad app (an Android App is under development). There is also a free Windows or Mac download which only offers text to speech. This comes with one free to use voice – Anna from the US has a robotic voice. You can try out a small selection of HD natural voices up to a daily limit of 5000 characters before you are prompted to purchase the paid versions. It opens Word, PDF and other documents or copy/paste from docs. If you’re on the lookout for a decent text to voice reader, which is extremely helpful for editing work, download the free desktop versions of NaturalReader. These use a robotic voice (you can play with a few natural voices before prompted to upgrade to a paid version) – but the robotic voice may be all you need. The cloud based service looks intriguing given the ability to use 30 voices, and use via free tablet or mobile apps also. Middle grade or children’s writers will also be interested in the four available kids voices NaturalReader can provide. With Word and other office doc integration, and the ability to convert to MP3s, desktop versions may also offer some good functionality. NaturalReader 12 (Windows) available in personal, professional and ultimate versions as a software download with from 2-4 natural sounding voices. The personal version costs USD$69.50. Comes with browser plugins and OCR technology, coversion to MP3s for listening and MS Office addins. NaturalReader Mac 3.0 available in a personal version for USD$69.50 with 2 voices. Additional voices available (for purchased software). 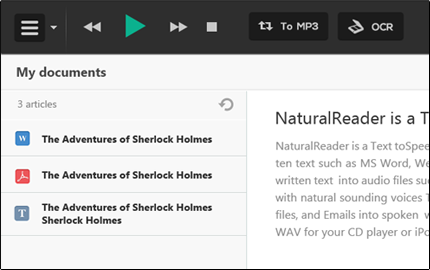 NaturalReader Cloud – this subscription package costs USD$99.00 pa, but comes with 30 natural voices (online) via desktop app software, 4 offline voices, and unlimited access via an iPAD app and some additional benefits such as free ebooks to read. OnlineTTS – new users will have some access to play around with the online version which allows you to copy and paste in inputs, or input via dropbox, googledocs or web browsers. Ebooks are available here also. 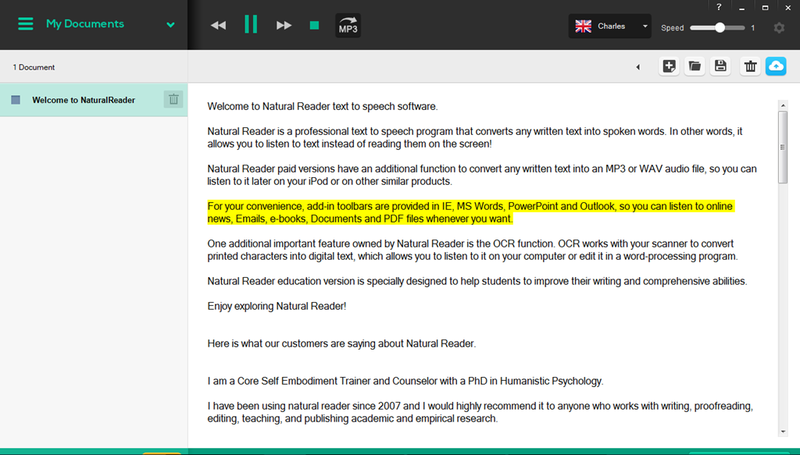 NaturalReader12 (Windows) and Mac 3.0 free version – download for text to voice on Word or PDF or text docs. A robotic voice only. NaturalReader iPhone App – the free version offers premium upgrade options including purchases for additional voices. The full version costs $13. NaturalReader website – the homepage offers you a small cut and paste field to try out all the voices. Free NaturalReader 12 (Windows) or Mac 3.0 – download page.